So what do powder coating, grab bars and epic door handles have in common? Answer: A creative designer meeting the special needs of an artistic client. We derive immense satisfaction from working with creative designers and over the years have collaborated with many to customize our designs so they will meet a client’s specific needs. 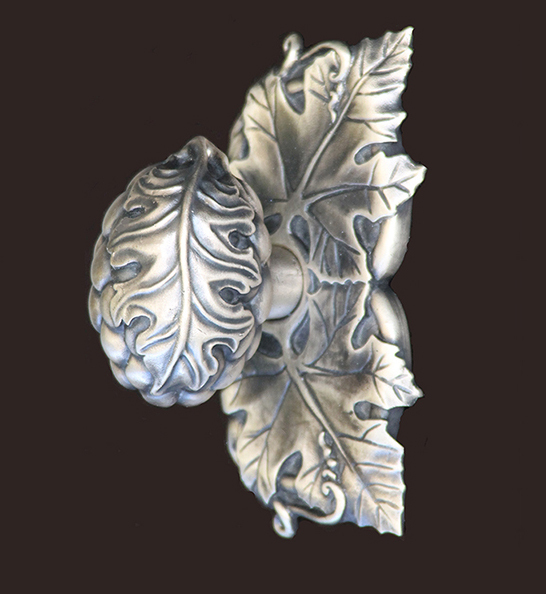 Diane Morrison is a designer who we first worked with when we adapted our Grapevine door handle for use as a hand rail on a corridor wall. Diane is based in Downingtown Pennsylvania and often works with contractor Merv Landis on her local installations. Recently Diane approached us to see which of our Ergo designs could be adapted for use as a grab bar in a powder room project. The room had existing pewter and iron trim and while the client wanted to continue with these metal tones we needed to use a more sturdy metal and one that would hold up to moisture. Stainless steel as a rust resistant alloy was an obvious choice but many of the patinas one can apply to it are not sufficiently durable. Diane sent us a color chip and with Dan Regan’s help at Primo Powder Coat we were able to find the right powder to bake onto our stainless steel handrail to create a highly durable finish. The Ergo epic pull was the perfect choice of design from this series being a sturdy 35” handle but we were dealing with an existing space where the supporting studs were spaced at 16” intervals and the Ergo mounting posts were set at 34”. Merv Landis solved the problem by creating a sturdy brace inside the interior wall that spanned 2 sets of studs and provided a solid structure for our lags bolts to screw to. Lately, in large part at the behest of designers, we have begun to design some very grand scaled door grips for the public areas of hotels and clubs. The size and shape of a door handle does influence the handles design, with long narrow grips dictating a more compact motif and with wider panels allowing for a more expansive forms. In short, our designs for tall door grips fall broadly into these 2 categories and we have begun by focusing first on the more restrictive long thin pulls which one typically sees on storefront and bank doors and with lengths varying from 40” to 72”. We are using 60” as our optimum design canvas and are creating decorative segments of 18” and 24” that can be repeated or interspersed with other designs or plainer sections so that we have the capability of creating custom lengths for each project. The segmented and narrow width of our design canvas impacts the freedom, balance and logic of our design. As a starting point Martin began by looking to the utilitarian and geometric shapes of the 1920’s Art Déco period and the influence of these repetitive bold lines can be seen in the sketch below. He also used his own Hedgerow furniture designs to create an angular tree branch motif. These sketches are at this point concept drawings and we will be refining them over the next few weeks. One of our earliest introductions to the American arts and crafts movement came when we discovered the Gamble House in Pasadena. This gem is a perfect example of the craftsmanship and artistry that is the name sake of this organic architectural style. When we arrived in Los Angeles we started out as a small furniture company that specialized in hand carved pieces so it is not surprising that we were awestruck by the design brilliance of the Green and Green brothers who were commissioned by the Gambles to design their home. The Gamble house offers a wonderful insight into households living in a less technological world and one where construction techniques were integral to whole aesthetic of the house. When constructing the walnut stair hand rail and cabinets the carpenters used peg joints rather than mortise joints which gave the joint strength but also added a decorative contrast. The carpenter would hand drill a round hole into the walnut and then using a square walnut peg he would hammer this into the hole to create a strong and contrasting joint. While we had a fleeting introduction to the Arts and Crafts style in England this had been limited to viewing exhibitions of William Morris’s textile and wallpaper designs where entwining acanthus leaves and brambles were common subjects. Together these movements have channeled some of our cabinet pulls as can be seen in our Hedgerow drawer knobs. The patterns for these pieces were carved in wax by Martin Pierce and after molds had been formed these designs were rendered in bronze using the lost wax method of casting. As spring drifts to summer so we drifted north 350 miles to the still green countryside of Paso Robles. We have been re-charging our culinary and artistic batteries in this delightful countryside for 15 years and have seen it change from an agricultural community to an acclaimed wine making hub. While some may debate the merits of such intense viticulture and the orderly tidiness that now characterizes much of the scenery, few would contest that the region is home to some of the best wineries in the state. As the wineries have grown so has the breadth of wines now grown with the historical Zinfandel now co-existing with Syrah’s, Grenaches and Tempranillo varietals. As a white wine imbiber who shuns chardonnays I have been thrilled to see that Sauvignon Blanc and Viogniers are gaining audience awareness and acceptance even amongst those who are fond of their oaky siblings. However what I had not realized until this visit was how the wineries have now sought to attract customer by serving gourmet meals often locally sourced. The case in point was to be found on Vineyard (aptly named road in the Adelaida district) when we stumbled upon Opolo Winery in search of lunch and for a very modest sum feasted on roast lamb tacos served with tomatillo and red salsa and corn tortillas. The roasted meats all paired wonderfully and surprisingly with their Albarino white wine which was full bodied with slightly sweet citrus tones. The view from the wineries hilltop marquis was also stunning and the breeze it offered was a welcome relief for what proved to be one of the hottest Sundays this year. If you are planning a trip to Paso Robles you may help navigating your way through the200 wineries it now boasts but help is on hand courtesy of www.pasorobleswineries.net where you can download a complimentary map. We have this year enjoyed a refreshingly wet winter here in LA and as a result have an abundance of flowering trees and foliage so it should come as no surprise that we have a large insect population. While we may not enjoy the large mosquito population the moths and butterflies are a breathtaking delight. Attracted by white light, we usually glimpse hawk moths hanging on our patio wall but this year we are finding them in the house on closets, on shutters and in the bathroom. We had a preview of what we could expect by insect life when the long legged ganglycrane flies started arriving. The sheer number of crane flies, which are often mistaken for gigantic mosquitoes, was so large that it has almost cured my phobia of this marginally attractive insect. However, when it comes to moths and butterflies their sheer beauty is undeniable and their shape and color have always been a source of inspiration for Martin. While bronze can be colored by applying ferrous nitrate to a heated area to make a yellow amber patina or by applying copper nitrate for blue tone these patinas cannot begin to replicate the complex patterns that moths display in nature. So when portraying moths and butterflies in bronze, Martin has focused on the elegant and dramatic shapes of their wings and bodies and the natural gripping points that occur where the wings join the thorax. We have added a new video to our video gallery and now have 2 videos that show the full range of door handles that use tree motifs. The latest video is short but still manages to show the three dimensional nature of this iconic handle which is shown in brushed stainless steel and as a handle set, with one left and one right tree. The video shows the fluid nature of this sculpture and the close up shots focus on the depth of the details in the leaf, root and canopy areas of the tree design. By panning across the tree trunks and up the profile of the canopy our video director, Jeff Jenkins, has been able to capture the shadows cast by the leaf canopy. The video was shot very simply using mainly natural light and this in conjunction with the dark ash doors gives the video an old moody black and white quality. The mood of the video is in contrast to the medium of stainless steel which it often pegged for more contemporary settings. By shooting the video this way, Jeff Jenkins shows us how thin the line is between the older rich and colorful style of Art Nouveau and the current trend towards monochromatic linear designs. While the Hedgerow tree is shot in stainless steel, for those preferring the warmer tones of bronze, fear not, as this piece will always be available in the timeless medium of bronze. All of our work is designed and made in Los Angeles and can be seen by prior appointment at our studio. We have been focusing on re-vamping our website and in doing so have been developing new pieces, new videos and new finishes for some of our signature pieces. The Hedgerow door pull is perhaps our most well known and iconic piece that represents our love of trees and natural forms. As you may know the new Hedgerow illuminated tree is an ongoing work that is expected to be completed by years end but since that is months away we thought it was time to revisit the Hedgerow collection and so are now casting select pieces in steel. The cooler tones of stainless steel play well in a modern setting and work for both residential and commercial projects. While this Hedgerow tree is not part of our collection of luminaires it can be lit by directional accent lights to create a dramatic statement. The 3 dimensional nature of this piece and the detailed sculptural tree canopy are very difficult to capture in a flat 2 dimensional photo so we will be releasing a short video soon which will more adequately capture the depth and scale of this steel tree. By casting select Hedgerow pieces in steel, a rust resistant medium, we hope that these nature inspired pieces may take root in coastal locations! The Hedgerow tree and 5 other signature pieces are also making their way to our new banner gallery that can be viewed on our website. All of our work is made here in Los Angeles using the lost wax method of casting and each piece is finished by hand to create a truly unique piece.